Rich, light soil with plenty of organic matter added. Yes, but it is important to choose varieties known to grow well in your area to reduce risk of losing blooms to spring freezes. Cold damage to spring blossoms is a major limiting factor in where almonds can be successfully grown. Topdress with a generous mulch of well-rotted organic matter in spring along with a balanced organic fertilizer. Tansy. Corridors within the orchard that are planted with clovers and other legumes contribute to soil fertility and attract pollinators. Incorporate plenty of well-rotted organic matter when planting. A wide hole is better than a very deep one. Mulch after planting, and encircle the trunk with a wire cage or protective pipe to protect the young tree from animal and insect pests. 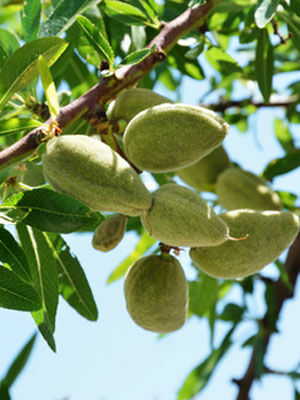 Healthy almond trees will bear for ten to fifteen years or more. Knock nuts down when they start to drop, then peel and dry them. Keeping almond trees dry under cover or under plastic sheeting can help prevent peach leaf curl and rotting fruits. Poor growth and dieback can sometimes be treated with hard pruning and heavy applications of well-rotted organic matter.